Andrew Wicks graduated from the Royal College of Art Ceramics & Glass MA course in 1997 and was awarded a Setting Up Grant by the Crafts Council in 1999. 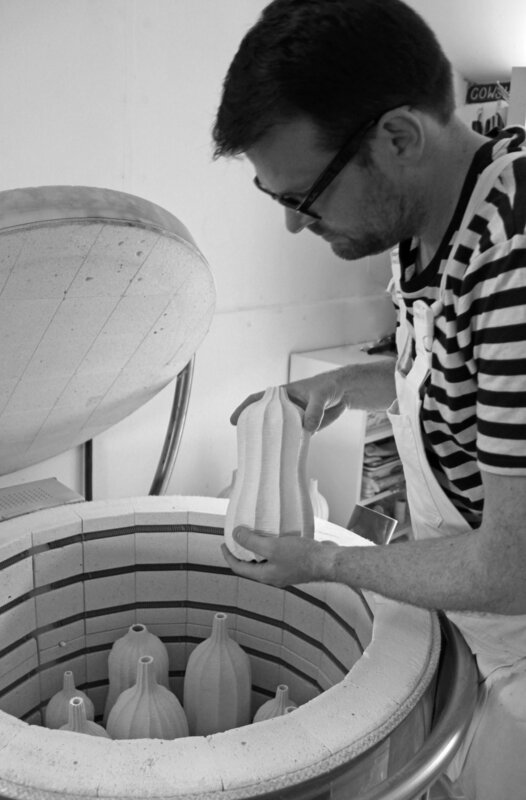 Having worked in slip-cast porcelain for over ten years Andrew decided to take on a new challenge and taught himself to throw in porcelain clay in 2006. Throwing gives a versatility and freedom to create unique forms and differing scales. Once the vessels are thrown and turned the design is carefully marked up onto the smooth pot ready for the intensive process of hand carving. Andrew uses a large number of hand tools to create his faceted, textured forms. Once carving is completed each piece is slowly dried out over many days. They are initially biscuit fired and then glaze fired to 1250 -1260 degrees Celsius. Andrew usually works in groups of vessels as he enjoys the visual relationship between the forms. The textured surfaces evident in Andrew's work are often inspired by patterns found in the natural world such as fossils, coral reefs and magnified plant forms. Andrew’s work has been featured in many galleries and ceramic exhibitions in the UK, Europe and USA. My first maker's mark was carved in plaster but after a year and a half this wore down and was remade by my jeweller friend Gerlinde Huth who made a beautiful brass one which is still going strong and getting better after 17 years. It has quite often been nearly lost and rescued within clay scraps from turning. Long may this useful (and treasured) tool last! Each year I carve a plaster date mark. These have proved very useful over the years as I can see how qualities in my work have changed and improved over the years.